Veteran circus performer Chris Steele has been swallowing swords for over a decade — but last week, he was seriously injured after an act involving 13 blades went horribly wrong. 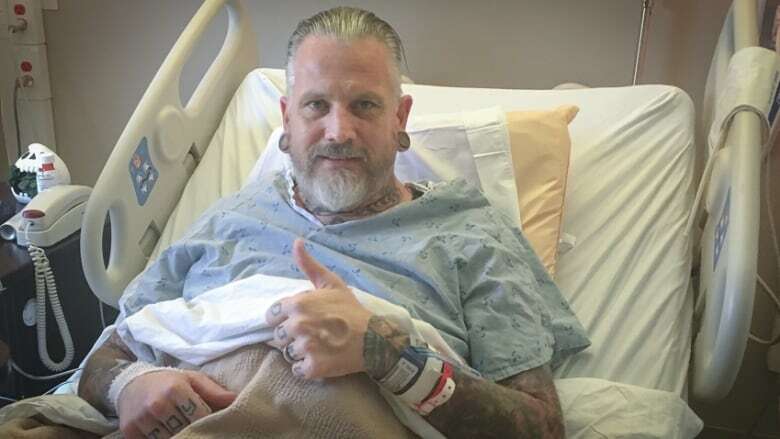 Veteran circus performer Chris Steele has been swallowing swords for over a decade — but last week, he was seriously injured after an act went horribly wrong. Steele, known by his stage name Captain Steele, has appeared with his wife and fellow sideshow performer Elaina Steele on America's Got Talent and Ripley's Believe it Or Not. Last week at an event in Atlanta, he swallowed 13 swords at once. He's completed the act over 100 times in the past, but this time he ended up with a perforated esophagus. As It Happens host Carol Off spoke to Steele from a hospital bed in Austell, Georiga, where he is recovering. Here is part of their conversation. Captain Steele, how are you doing? I'm recovering well. Doctors are saying I am making some progress. I guess if I could say anything positive, I got to start on a liquid diet. This is the first thing I've had to eat or drink since about 3pm last Thursday. It's amazing you can say anything at all, having put 13 swords down your throat. It's amazing I'm even alive. It was a very close call. I like to say that possibly someone in the great midway in the sky was looking out for me, because it was a pretty rough accident. I'm generally taking 13 swords and pushing down into my esophagus, and then I spin them 180 degrees and then pull them out. Well, instead of pushing through that, I pushed through the side wall of my esophagus and pushed it 16 inches down into my chest cavity, and then spun it 180 degrees and pulled it out and somehow avoided hurting any of my internal organs ... it's a miracle I'm even sitting here talking to you today. How long have you been swallowing swords? I started learning to swallow swords about 18 years ago. Actually, yesterday makes 10 years since my first stage show ... so my 10-year anniversary I ended up spending in the hospital. It's the first time I have had this type of injury as well. I'm not just doing one or two shows a year or a month. Last year I did 411 shows. Me and my wife do a lot of travelling. I was a very bullied child. I wasn't treated like others. I was different and awkward. I did fall in love with the circus because they accepted the freaks and the weirdos and the rejects … and so rather than just being an entertainer, I used it as a platform to help others. I mean, was there no other act? Was there nothing else you could do in this circus except swallow swords? Was there something less dangerous? I do a lot of those too. But come on — sword swallowing is the most respected stunt in the sideshow. It was an exhausting day. I had worked two big gigs before that ... then we went and did our full show, and then after that I did a part that I do with a band that was local. I ended up doing the stunt, but it was in a venue that had very low ceilings. A lot of times when I am in a venue with low ceilings, I've dropped to one knee and I'm able to do it anyway. In this case I think a combination of exhaustion, of just not having [the] angle right and so forth, it happened. How soon after you did the act did you know that something had gone seriously wrong? Was it immediate that you could feel the puncture? Well immediately, there was definitely a lot of blood on the swords. After that, I knew that something had happened, but I didn't know if it happened inside my esophagus, or if I perforated my esophagus. Within a half-hour of time, you could actually feel around my neck — we call them Rice Krispies. It's when air gets under the skin. It's kind of a crunchy Rice Krispies feeling. I know it's kinda gross. Immediately I knew that air was getting into there, and I knew there was a problem. Oh my gosh. How did the audience respond to all of this? They never knew a thing happened. You know one thing is that was the finale of that part of the show that I was doing. The crowd didn't know anything happened. I went to the back and kept everything away from the audience. I had a lot of people that were at the show message me later and said, "I had no idea." I guess that's kind of what we do. We always try to make ourselves look like superheroes. Will you go back to sword swallowing when you get out? Absolutely. It's what I was born to do. Absolutely. I have too much unfinished work. Written by Jonathan Ore. Segment produced by Sarah Jackson.